We have all seen those emotional reunion videos. A soldier who is returning home surprises his or her family, and you can’t help but get all choked up. The sacrifice the men and women of our Armed Forces make for us is a debt that can never be fully repaid. As a former Army brat, I can tell you a military family is unlike any other family you will ever know. In this video, after being deployed to Southwest Asia for six months, Technical Sergeant John Grieten is finally home. 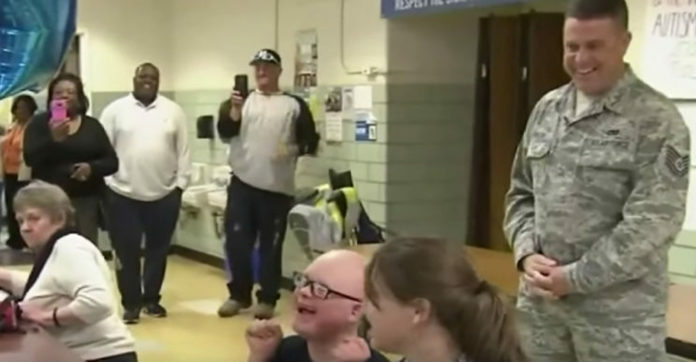 He is about to surprise his son, Joshua, at school. Joshua, 15, was clearly blown away to see his dad! Grieten then went to see his daughter. She jumps for joy when he asks to sit next to her during lunch. Welcome home dad and thank you for your service! Share away, people!